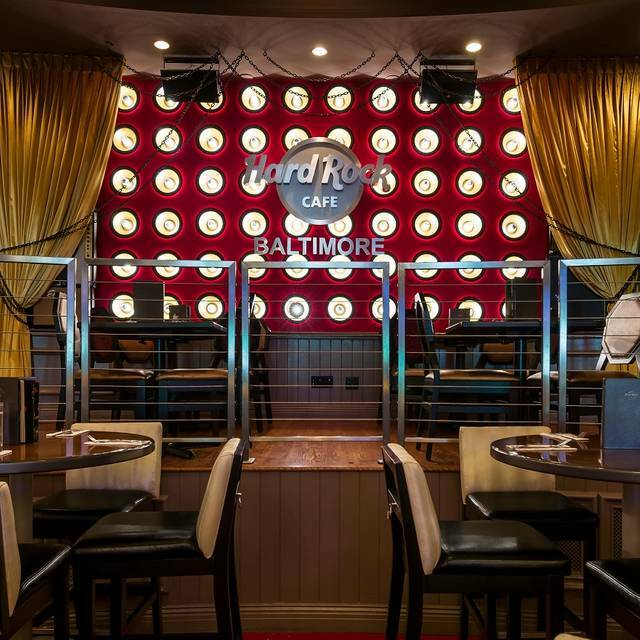 You must make reservations at least 5 minutes in advance of the time at Hard Rock Cafe - Baltimore. 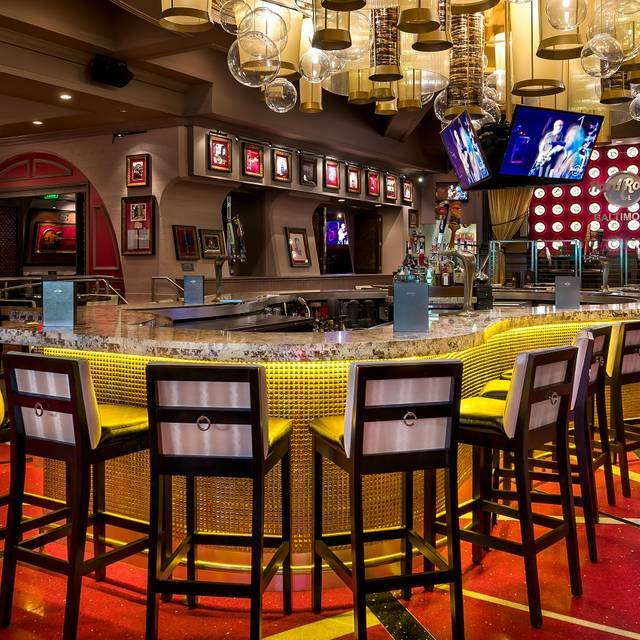 From our wraparound bar to our patio tables, every seat is the best seat in the house when you visit Hard Rock Cafe Baltimore. 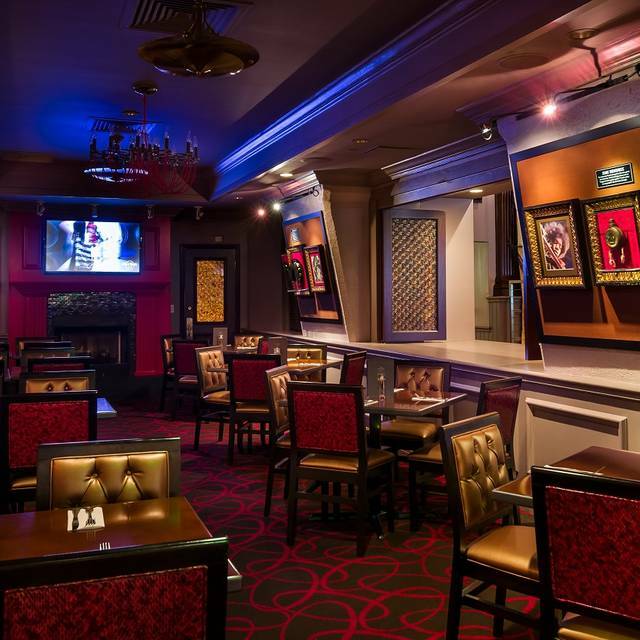 Immerse yourself in music history with authentic memorabilia from top musical legends while enjoying classic American cuisine and our signature cocktails. 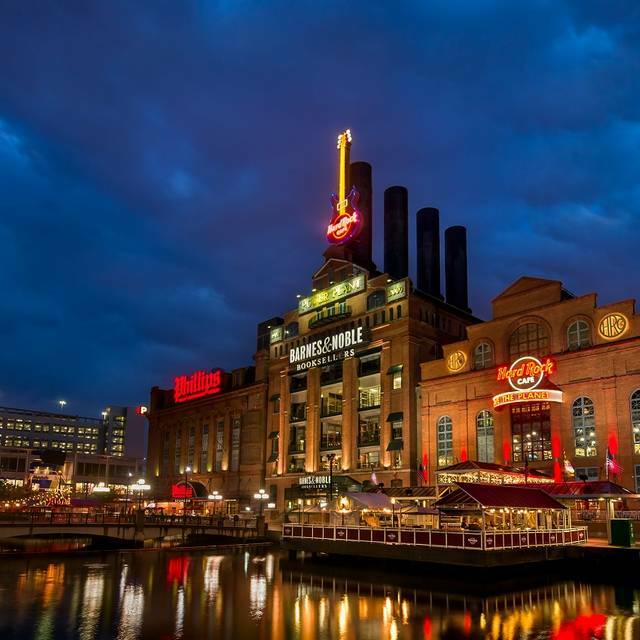 Located in the historic original Power Plant Building in the Inner Harbor, Hard Rock Cafe Baltimore sits between the world-renowned National Aquarium in Baltimore and Harbor East. We are within walking distance to the Baltimore Convention Center, Oriole Park at Camden Yards, and M&T Bank Stadium. 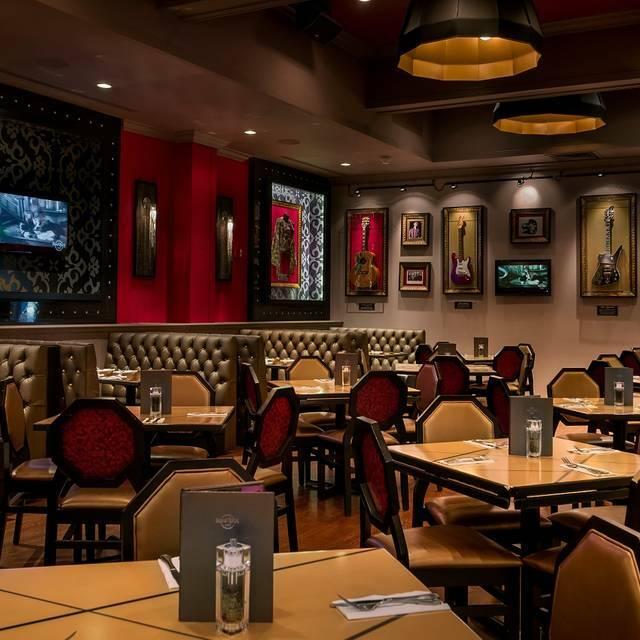 Mouthwatering flavor takes center stage at Hard Rock Cafe Baltimore. Dazzle your taste buds with a selection from our unique menu featuring house-made entrees spiked with local flavors. From our Legendary® Burger to our delicious desserts, there is sure to be a menu item to please everyone in your entourage. 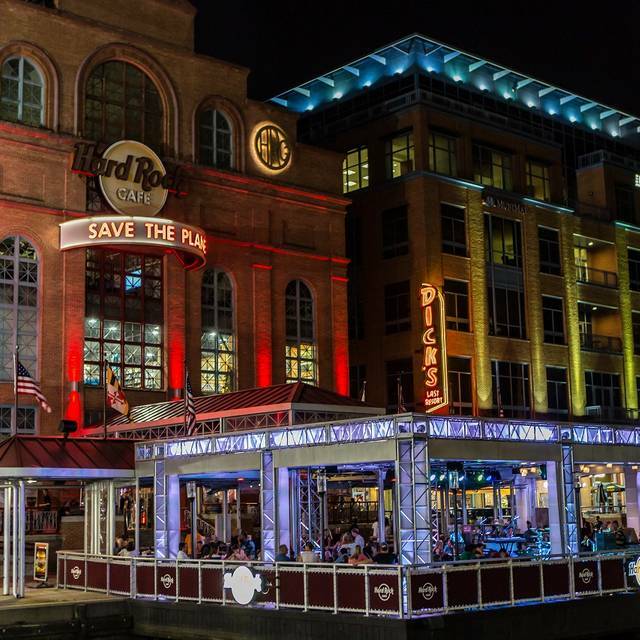 From our wraparound bar to our patio tables, every seat is the best seat in the house when you visit Hard Rock Cafe Baltimore. 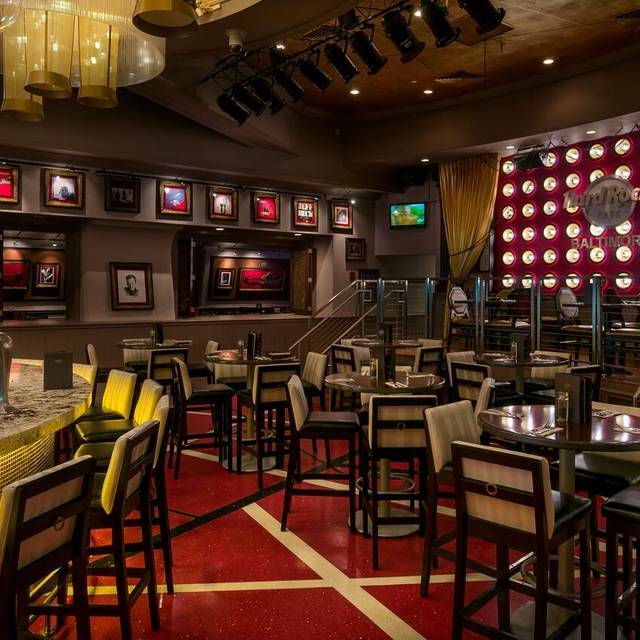 Immerse yourself in music history with authentic memorabilia from top musical legends while enjoying classic American cuisine and our signature cocktails. 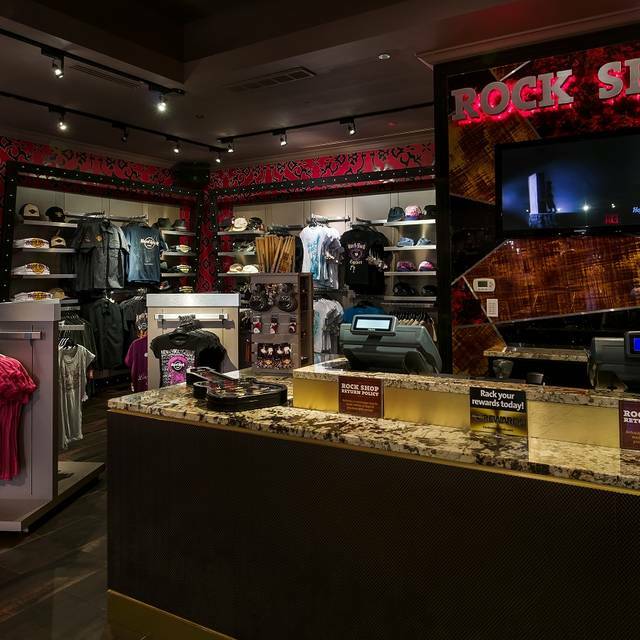 Don’t forget to stop into the Rock Shop®. He was your first Groupie, Band Manager and Fan. Celebrate DAD! on June 16th at The Hard Rock Cafe and treat Dad like the Rock Star he is! 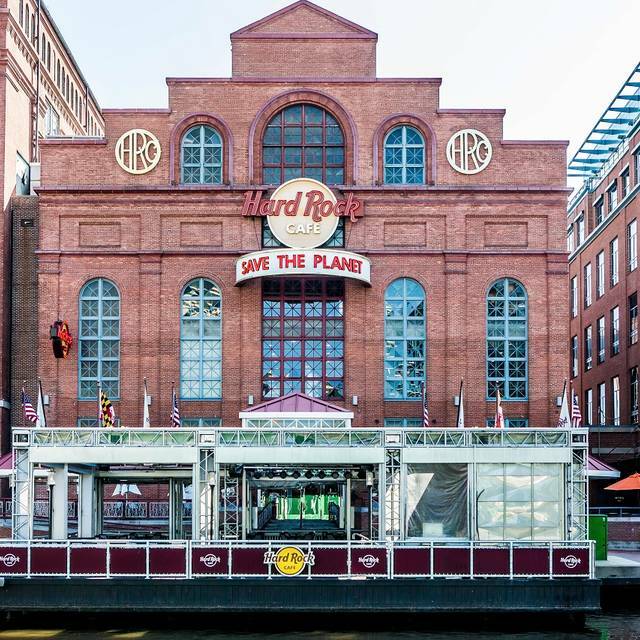 We once again had a great experience at the Hard Rock in Baltimore. The food was the same great quality we have come to expect at all Hard Rocks around the world. The service in Baltimore was especially noteworthy. Our waitress was kind and attentive. We didn’t even have to ask for drink refills. She just brought them! We are looking forward to going back soon! I made a reservation for Hard Rock, but arrived almost an hour earlier than my reservation. In some restaurants they make you wait your reservation. I was very pleased with Hard Rock's customer service. They figured out if they could bump up our table, shuffle some things around and were able to accommodate us. Overall, it was a nice experience. Celebrated my granddaughters birthday and everything was great. Our server was the best!!! You know what you're getting at Hard Rock ... not fine dining but experience. The steak was good, the caesar salad mainly tasteless, the kids' meal a fair value. We took our granddaughter there for fun and it was fine for that purpose. Service was very good. Thanks so much Indy! We hope that you will come back and visit us again soon! Our waiter was terrible. He failed twice to bring menus for our children. We sat with empty drinks until I sought a manager to assist and to make it worse! You had such an experience” guess what!! It was still charged to my bill. Shocker after the service. We won’t be returning. The food was excellent, cute decor. Service was insanely slow ! I myself am a server, over 10yrs so i get it, mistakes happen but this service was aweful. We waited 10+ minutes for ketchup. We honestly waited so long when we asked our server for anything. She forgot things, gave kids wrong dressing and wrong side for food. Why not write it down...? They were preparing for a large party later in the evening so the restaurant was pretty much a ghost town when we left. We were seated at our reservation time. It took 20 minutes for a waiter to acknowledge we were there. Finally got our drink orders in. 15 minutes later we put in our food order. It took 45 minutes for our dinner to come out. The waiter forgot our drinks, thankfully the bartenders brought them. The waiter never checked back. He took our plates away and disappeared for 40 minutes. I went to ask the hostesses if we could get our check. Parties were seated, ate, and paid before we even got our check. We will not be returning!! Service was friendly, but slow, not very attentive. Burgers were good, but flatbread dish was only so-so. Kids had a good time, fun environment. Expectations weren’t too high, but food wasn’t quite as good as I remembered. Service was horrible. We had two different waiters and neither were attentive. We asked for items multiple times and they were never brought to our table. I follow a restrictive diet, which was conveyed to the waiter, which he was more than happy to oblige me on...but the kitchen staff obviously doesn’t bother fully reading through order tickets. I ordered plan salmon and plain broccoli, and extra plain broccoli in place of the mashed potatoes. Everything came with butter on it and one bunch of broccoli had seasoning on it, while the other was almost still raw. Thankfully, I am not severely allergic to most foods. However, if someone was, they would’ve been ill or even dead from not being served the food they ordered a specific way. I also ordered a shrimp skewer that never came AND my boyfriend ordered fried onions on his burger, which weren’t there either, but we’re then brought after we made the staff aware. We aren’t complainers and wouldn’t even have said anything, but the waiter was aware enough for all of us and apologized and did what he could to make the sitstuon right. All I could think about was, “what if someone had celiac disease or a severe allergy to dairy, and was served something they couldn’t eat and went into anaphylactic shock”? Because it can and does happen! I strongly advise the kitchen staff AND the manager be trained and retrained until they all know how to do they’re jobs properly. How scary. I worked at HRC Pittsburgh for 4 years. I make it a point to visit an HRC when I'm traveling if I've never been to that city before. It was my bday and my BF had never been to ANY HRC before. I have expectations of being "WOWED" given my history with the company but that DEF didn't happen. Things weren't BAD, but it just wasn't the AWESOME HRC experience that I've come to know and love... it was just another overpriced meal out. Kinda disappointing and sad. Food had great taste and quality though, so that part was still the same. We liked the BBQ pulled pork sandwich and the Oreo cheesecake. Excellent drink menu, too. Better food than all other Hard Rock Cafes that i have been to. Great experience! Thanks Gemma! We are glad that we could exceed your expectations! As we walked down the little avenue of restaurants across from the National Aquarium, we spotted a high school group of about 30 entering Hard Rock. We made a quick u turn and popped into Joe's Resort Crab Shack, which was completely empty. Sadly, the four of us were greeted so rudely by a manager no less (we asked to see one) we left to take our chances with a very busy Hard Rock. We should not have hesitated. We were warmly greeted and immediately shown to a table in their large dining room. Our server came very quickly, took our beverage orders and continued with expert attentiveness. Expecting a wait from the kitchen due to the big big party, we were surprised to see our food come out quite quickly, and perfectly! Two had burgers, one had fajatas, and one had a chicken caesar. Everything was tasty and well prepared. We finished with shakes and one ice cream sundae. The only reason I didn't give it 5 stars is that it is quite pricey. However, we're in the thick of a tourist area, so it should be expected. The burgers were nearly $16, shake was 6.95 and on the small side. However, we felt it was well worth the tab for such a great experience. If you're looking for a low fat healthy option, this isn't the place for you. Otherwise, have a go....you won't be disappointed. I went to Hard Rock Cafe because it’s has such a legacy but it just ended up being a glorified Applebee’s. Over priced and overrated. Amazing service and the food taste great but there is no real value in what you pay for. You can go to Red Robin and get more unique burgers for about $5 less than here. I would not recommend the HRC for after the St. Patrick's parade. The staff seemed overwhelmed. I made a reservation for six. They thought it was for seven. They also said they were not honoring reservations. Nice to know after they accepted my reservation. They said there was a $5 cover charge which was not mentioned on the website that advertised the Sham Rogues performance on March 10th. My friend arrived before I did because we were in different units of the parade. She told them we were not aware of a cover charge and that I had definitely made a reservation. We know restaurants at the end of the parade route are busy after the parade. After much discussion, the staff decided to seat our party of six. Our server was nice, but he seemed overwhelmed. I would not recommend the HRC for after the parade. We only came there because of the Sham Rogues; however, we were finally seated where we could not see the band. Not a good experience, and we spent a lot of $! We liked the menu, and even noticed an attempt at some "local" food choices. Our Open Table reservation helped us to have a table at a convenient time for our group. The hostess was friendly, and our server was very helpful and nice! We made a reservation, arrived early and waited 15 minutes after the reservation time to be seated. Not everyone in our party was given drinks, they were forgotten. We ordered an appetizer that came out to the table with the food. The reason we went to this restaurant was for a birthday, the birthday person had never been and wanted to enjoy the restaurant. When we got our food, the birthday persons food never came with the rest, the birthday person waited nearly 10 minutes to get their food seperate from the group. By the time the birthday person received their food, they were in tears from the terrible experience. We asked for a manager on 4 seperate occasions. One of the children's plates came out with food and finger prints on it. From California and went straight from BWI to return to the Hard Rock Cafe Baltimore for the first time since 2005. It was rainy Sunday evening within one hour of closing, and this was the first time I was the only customer in any Hard Rock Cafe I have ever visited. The staff was very attentive while I was enjoying my New York Steak dinner as well as helping me pick out some Hard Rock Cafe T-shirts. Poor service. Did not approach us until 20 minutes after we had sat down, and asked multiple waiters who was serving us. Great good and service at this point location. Not too loud. The server was to busy and barely came to our table, we had food before drinks. She charged my card for both bills at my table and I couldn’t get through on the phone for a refund. The food was alright but not the best. Probably wouldn’t come back again. Great food and great service. I did see people waiting to be seated even early in the evening when we went. We had a reservation and were seated more quickly. Our server was excellent, the food delicious and we really enjoyed ourselves. The food was good. Our nachos came after our entree and were stale tasting or maybe microwaved too long. The water was busy and barely smiled. All in all it was okay for what we needed...to eat before our event. Troy was fabulous & you got exactly what you expected: a great meal at a good price. Great place to eat. It seemed to be a little slow when we visited, even though the restaurant wasn't full. Food was delicious, as usual! Service was great. We love visiting!! Even though there were a few people in the restaurant, we had to wait to be seated. Then we were seated in a crowded area with small children who were crying even though we were just two adults. Service was extremely slow, food was not good, prices were high. From the food to the waiter everything was outstanding. Took the trip from NJ to spend the day in Baltimore and it was a good decision eating there. Service was great! Not too crowded. I was with my daughter after a cheer event. We enjoyed our food and drinks. took a little long for our food. It was really crowded. DEAD! Won't be in business much longer. Mediocre food, poor atmosphere, rough service.